Sunrise views from the front porch! Ground floor studio condo with Pool, Hot Tub, Fishing Pier! The Sunrise Room located in the completely remodeled Laguna Reef Condominiums is the perfect place to spend some quality time away from home. 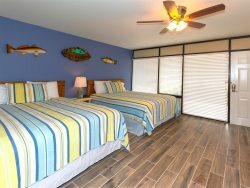 Whether your fishing off the new 1000 ft lighted fishing pier or soaking up the sun and relaxing by the pool you are certain to enjoy your stay here! This ground floor room has two queen size beds and will sleep four people and is dog friendly with a two dog maximum. The Sunrise Room also offers free internet and cable television. Along with a mini fridge/freezer and a coffee maker. Enjoy the relaxing coastal colors throughout the room and the spacious bathroom with a tub/shower combo as well. The Sunrise Room has a spectacular view of the water and is just a few steps from the hot tub and swimming pool. Amenities at the Laguna Reef facility include a swimming pool, hot tub, 1000 ft. fishing pier with fishing lights, several shared charcoal grills, beautiful grounds on the water, and a large parking lot with plenty of space. Laguna Reef is located near the Rockport Heritage District and Rockport Beach. Rockport is a charming coastal town with plenty of fun things to do including amazing restaurants and many local shops downtown to shop the day away at. The Rockport Art Center, Maritime Museum, Boat Cruise to San Jose island, and Kayaking are just a few of the activities you can enjoy during you stay. You are sure to have an unforgettable stay at The Sunrise Room!